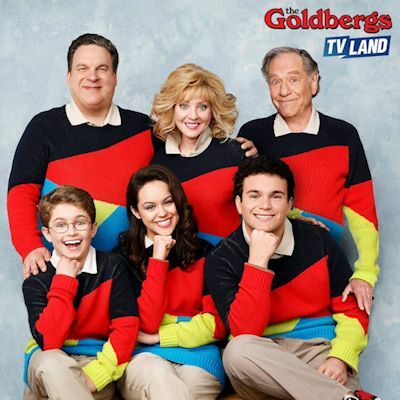 The Goldbergs is coming to TV Land beginning this Sunday (Sept. 23) with a marathon from 2-10pm hosted by Wendi McLendon-Covey, who plays Beverly Goldberg. The marathon episodes features the spoof episodes of The Goonies, Risky Business, Ferris Bueller's Day Off, Dirty Dancing and Weird Science, as well as Goldbergs favorite episodes such as "Spaceballs" and "Dinner with the Goldbergs." Then following the marathon, back-to-back episodes will air every night beginning Monday, September 24 at 9:00PM & 9:30PM ET/PT leading into Two and a Half Men and again from 2-3am ET on TV Land. Full episodes will be available on the TV Land app, TVLand.com and on VOD. The Goldbergs already was airing in late night on sister network Nick at Nite but when it comes to TV Land, it will stop airing on Nick at Nite and be replaced by more George Lopez. The 6th season of The Goldbergs begins next Wednesday (Sept. 26) on ABC at 8pm. The sitcom stars Wendi McLendon-Covey as Beverly Goldberg, Patton Oswalt as voice of adult Adam Goldberg, Sean Giambrone as Adam Goldberg, Troy Gentile as Barry Goldberg, Hayley Orrantia as Erica Goldberg, Sam Lerner as Geoff Schwartz, with George Segal as Pops Solomon and Jeff Garlin as Murray Goldberg. Freeform announced the start of production on season two of the critically acclaimed comedy series grown-ish. From black-ish executive producer Kenya Barris, grown-ish is a contemporary take on the current issues facing both students and administrators in the world of higher education. Produced by ABC Signature Studios and executive produced by Kenya Barris, Julie Bean, Jenifer Rice-Genzuk Henry, Craig Doyle, Anthony Anderson, Laurence Fishburne, Helen Sugland and E. Brian Dobbins, season two of grown-ish is set to debut in January 2019. 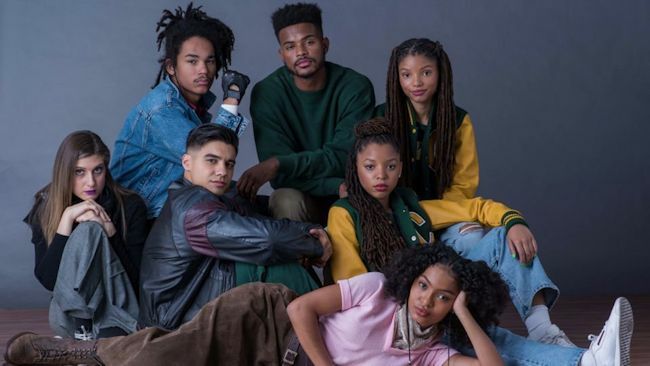 Reprising their roles after a stellar freshman season are Yara Shahidi as Zoey Johnson, Trevor Jackson as Aaron Jackson, Francia Raisa as Ana Torres, Emily Arlook as Nomi Segal, Jordan Buhat as Vivek Shah and Deon Cole as "Professor Charles Telphy." Chloe Bailey and Halle Bailey, real-life sisters who starred as twins and the sporty-savants Jazz Forster and Sky Forster, have been upped to series regulars. Their fan-favorite characters were a staple in the friend group throughout the first season, tackling topical conversations including dating as black women and the cutthroat world of college athletics. Outside of acting, the duo are Chloe x Halle, musical prodigies currently opening for Beyoncé and JAY-Z's "On The Run II" tour. Their debut album, "The Kids Are Alright" (Parkwood Entertainment/Columbia Records), includes "Grown," the theme song for grown-ish, which they co-wrote. Luka Sabbat also returns as a series regular for season two portraying Luca Hall, a mellow and fashion-forward classmate of Zoey's. While his methods are unconventional and subtle, he vies for Zoey's affection throughout the first season. Finally, reprising his role as Doug is musical artist, rapper and actor Diggy Simmons in a recurring role for season two.